It’s taken me awhile to get this post together, but it’s finally here. I hope you enjoy seeing the dresses I have for the fall this year. If you’re in Charlotte you’re always welcome to come to a trunk show or set up a time to come by my house. I’d love for you to see these in person! 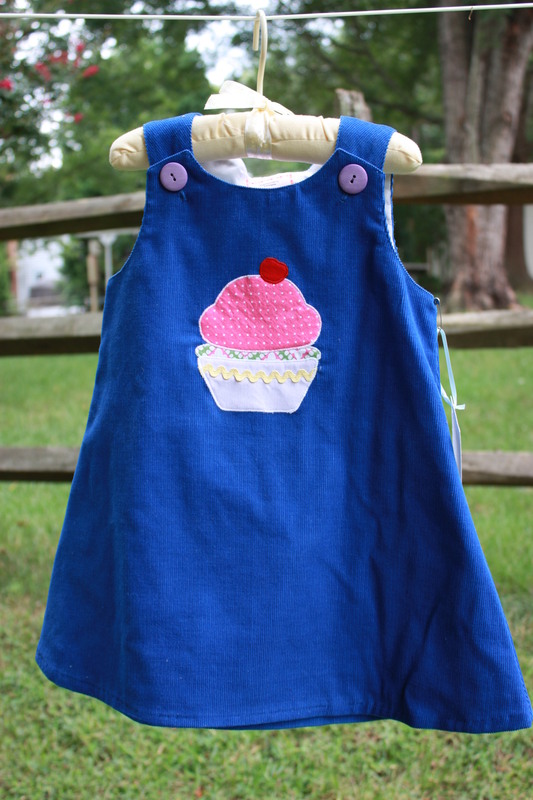 This is the 4th birthday dress I’ve made, and they’ve all been different. I really wanted to use this bright blue corduroy for a dress this fall – it’s so pretty and vibrant. I like how the cupcake turned out – purple pincord for the “pants,” yellow rickrack, and pink and green for the cake and icing. 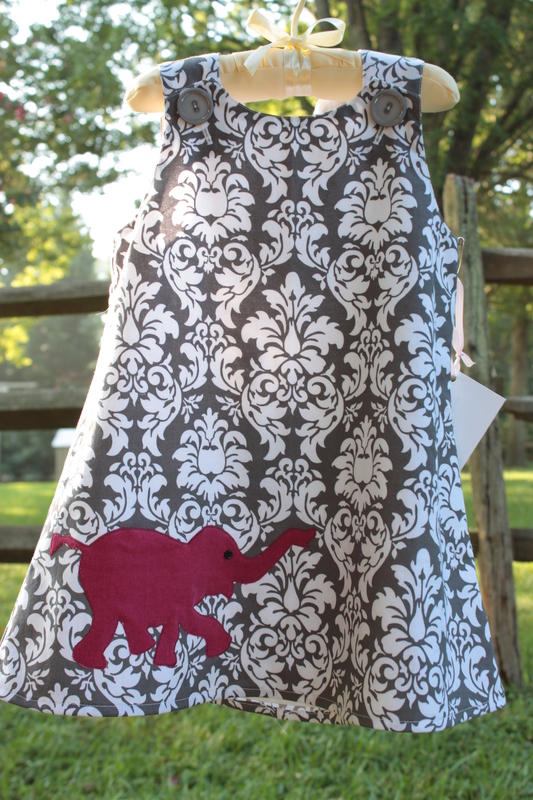 My sister helped design this dress, and it will be my niece’s after I’m finished with my trunk shows this fall. I love the color combination we came up with – brown, turquoise, and purple. And I think the mama and baby bird are really sweet. At our house we affectionately call this dress the Farm Dress, though I am calling the style Marie. 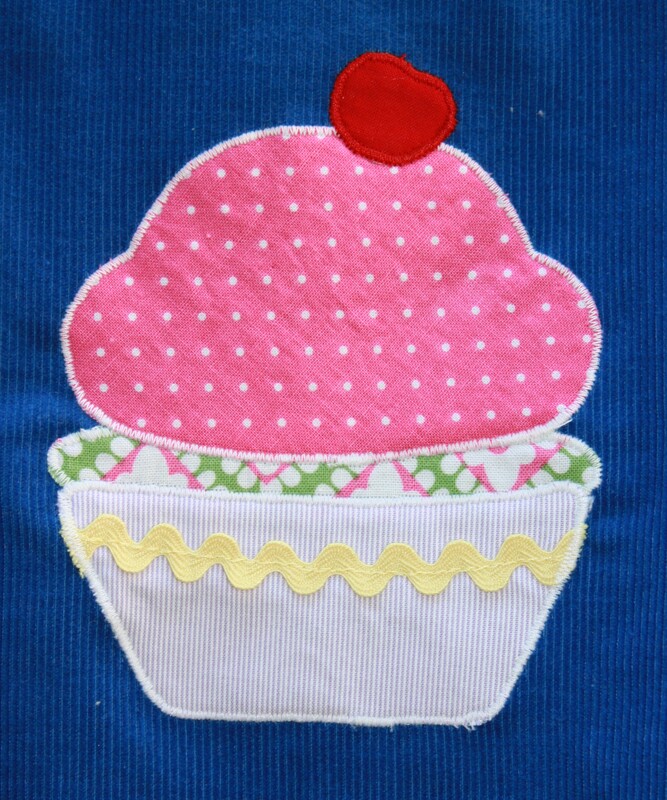 It buttons in the back, and can be made with or without the sleeves. I am really happy about how the combination of fabrics turned out, and especially excited to include a dress with farm animals on it! 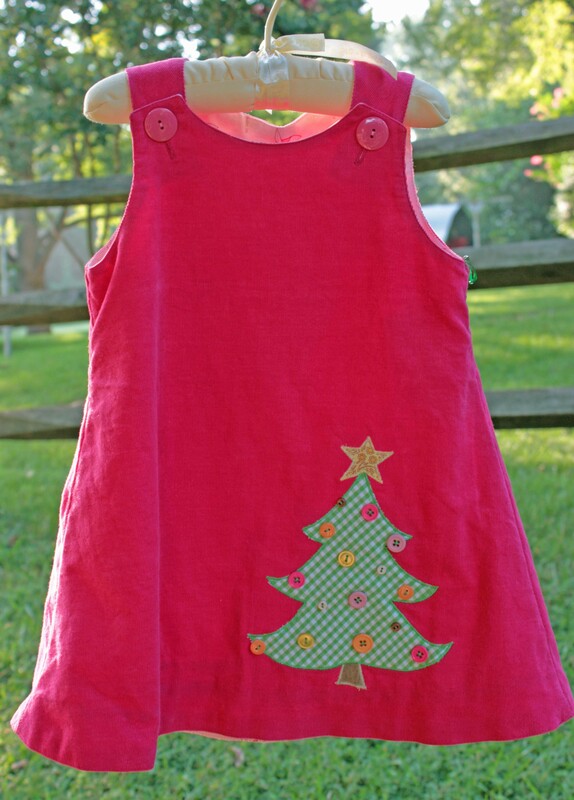 This is a relatively traditional Christmas dress with a fun twist – it’s hot pink instead of red. I fell in love with this corduroy when I first saw it, and when my sister suggested a Christmas dress made from it I knew that was perfect. It’s a soft, drapey, finewale cord, and the pink is fantastic. 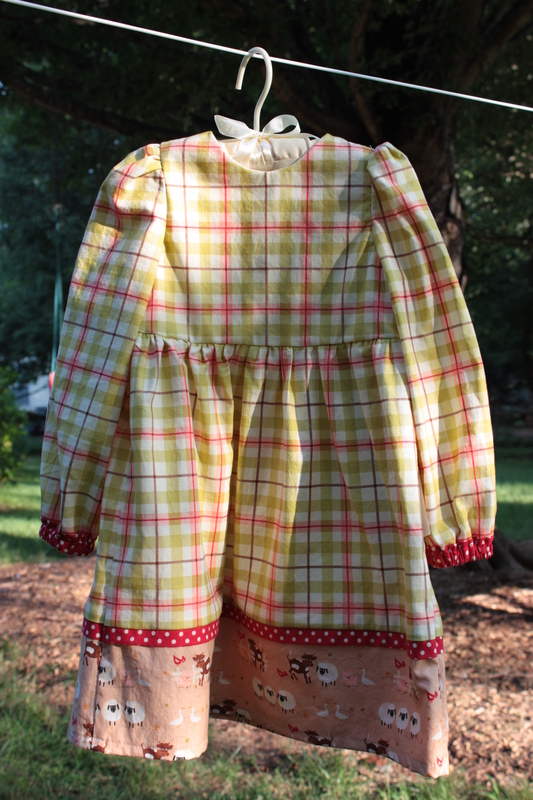 I love the combination with green gingham, and all the fun buttons. To make it more versatile, I made the Christmas dress reversible instead of just lining it. 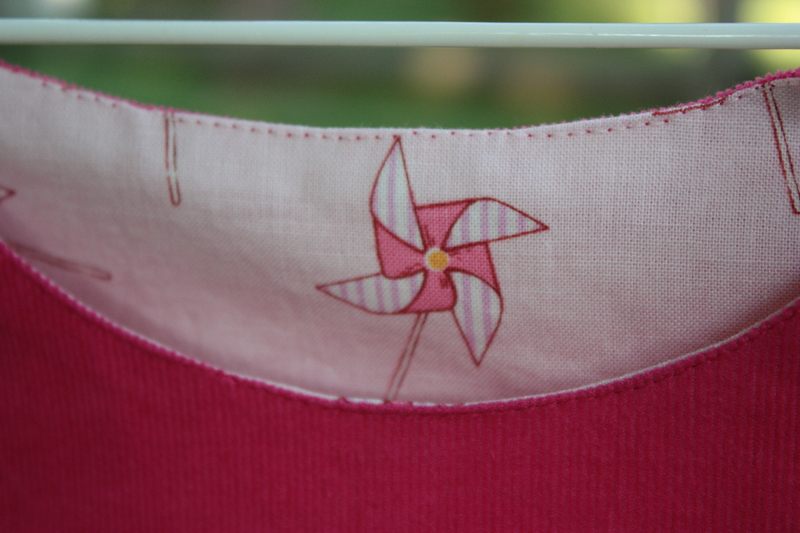 The pinwheel fabric, while maybe not a favorite choice for fall, will be just the right thing I think to welcome early spring. And it could be a breath of fresh air on those days in winter when you just don’t want it to be cold and rainy anymore! 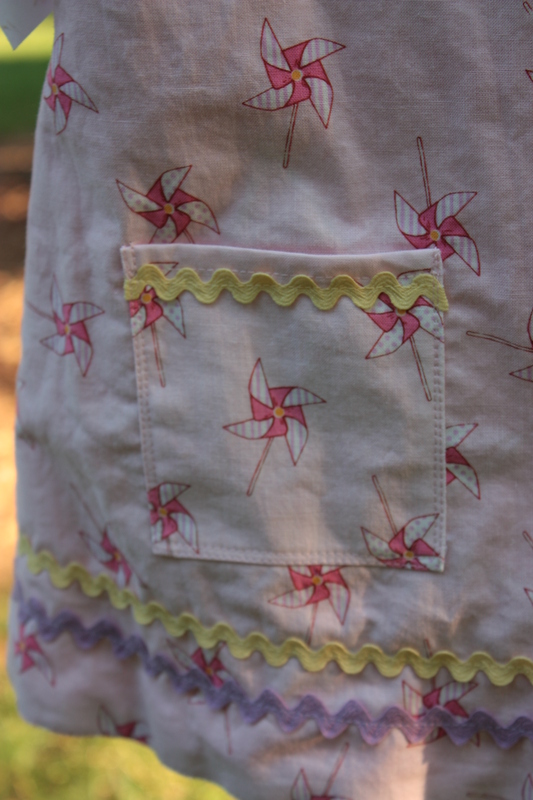 A touch of rickrack makes it playful, and the pocket is perfect for little treasures. 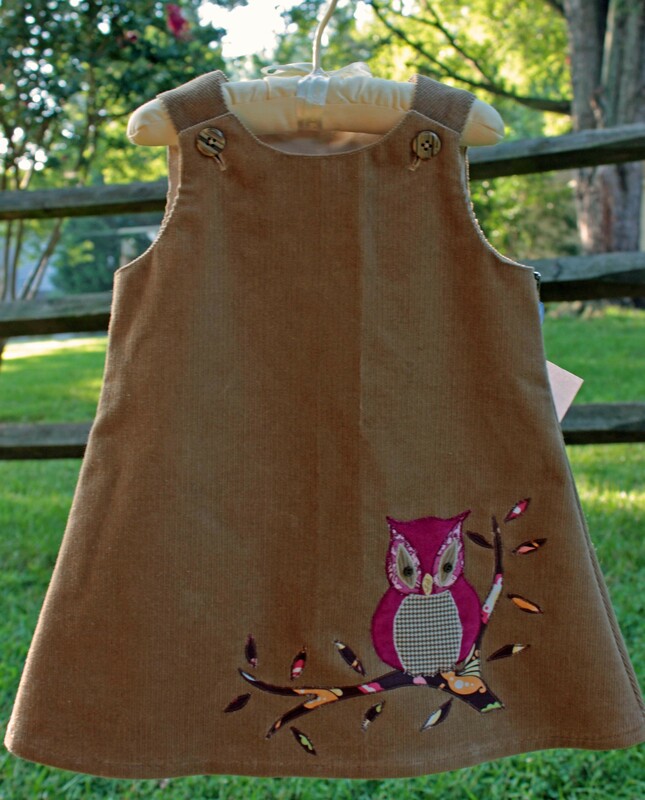 I made an owl dress for myself, and one for Caroline, last fall. We loved them, so I’ve decided to offer one this year for sale. I love the khaki corduroy I used for this dress. 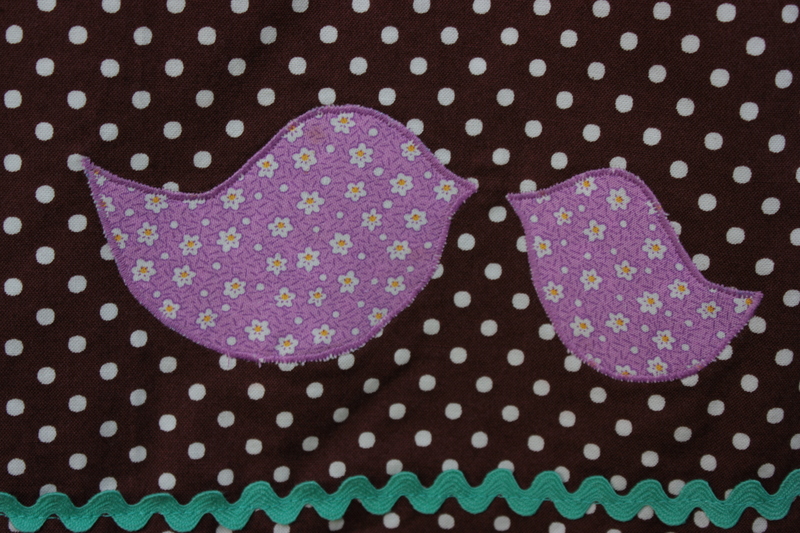 It seems like such a classic staple in a little girl’s wardrobe, yet with a fun twist with the addition of the owl. 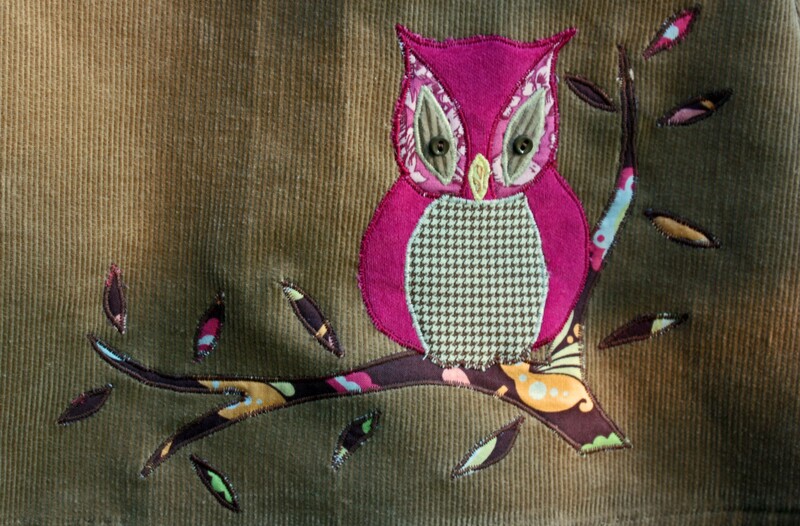 The owl is made from several layers of fabric stacked on each other: a rich rose velveteen, a cream and brown houndstooth, and a pretty rose print. I like how the different textures work together to create an owl that’s fun and playful. If you prefer, there is also a chocolate brown owl option, made with chocolate brown velveteen, cream and brown houndstooth, and a pretty yellow print. This is the first dress I designed in this group. 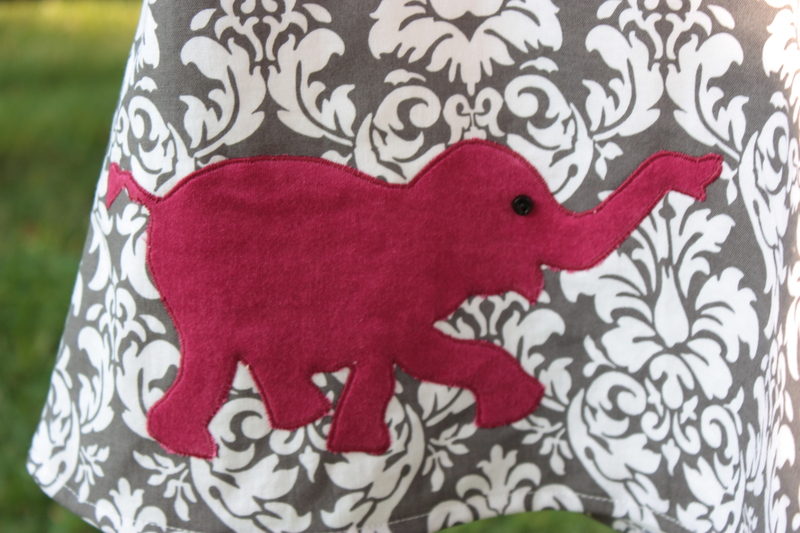 I discovered the fabric this summer, and knew it needed a pretty pink elephant to make it just the right amount of girly! I had to wait awhile on the fabric, as it just became available for sale in August, but it was worth the wait. 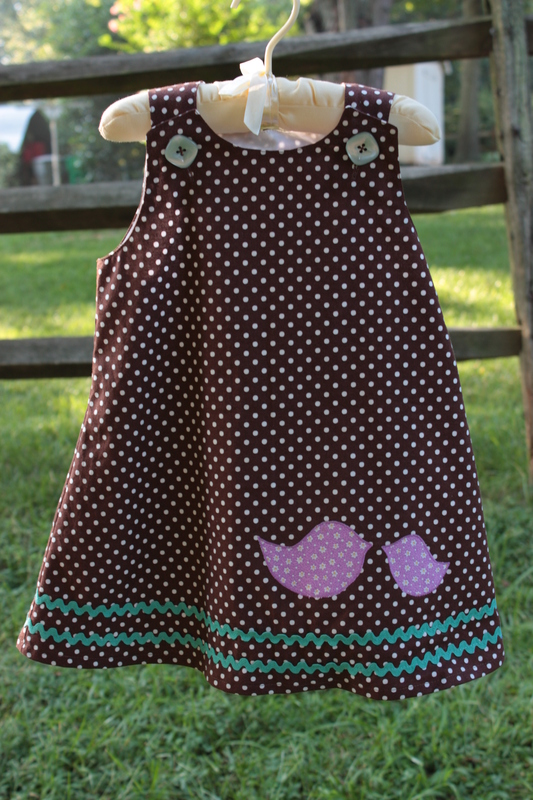 I love how this dress turned out, and so far it has been the favorite among other moms too! The elephant is made of the same rose velveteen as the owl, so it’s soft and touchable, and the color changes a little based on the light. It’s fun and playful – good for dressing up or dressing down! This dress is just right for fall days- it can be worn as a sundress when it’s warm out, or with a t-shirt underneath when the weather starts to get chilly. 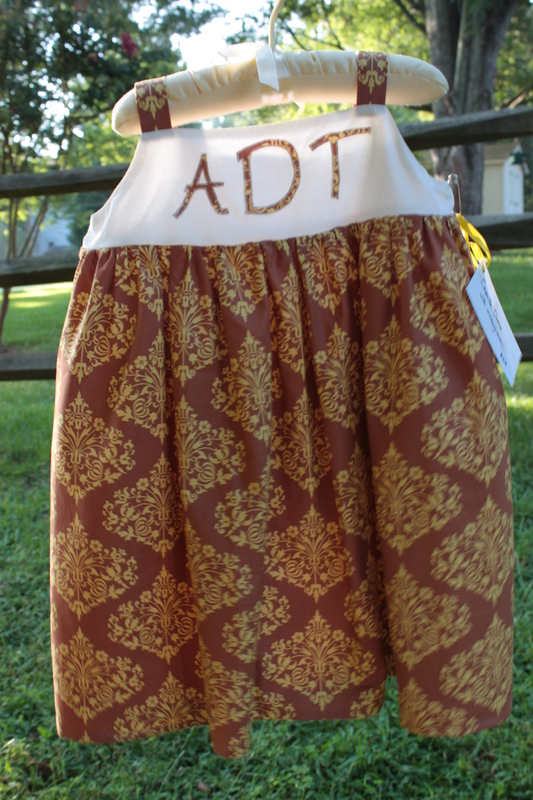 This one was made with my niece in mind and has her initials, but the top could have an applique, or your daughter’s monogram. All of the dresses above, with the exception of the Marie Style (Farm Dress) are fully lined. 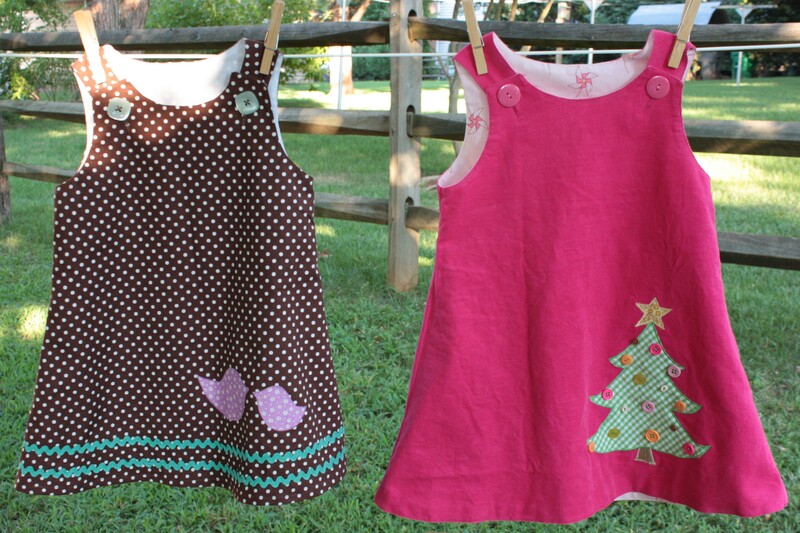 The Christmas dress is reversible. All dresses are hand-made by me, and can be customized to your taste and style. Fabrics and appliques can be mixed and matched, and any of the Anna style dresses can be made reversible. 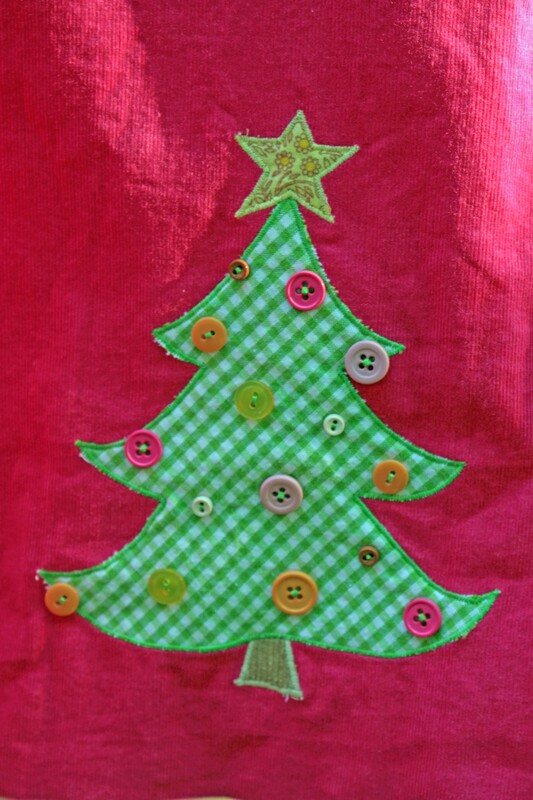 The Christmas dress or pinwheel dress can be made with lining as opposed to reversible. 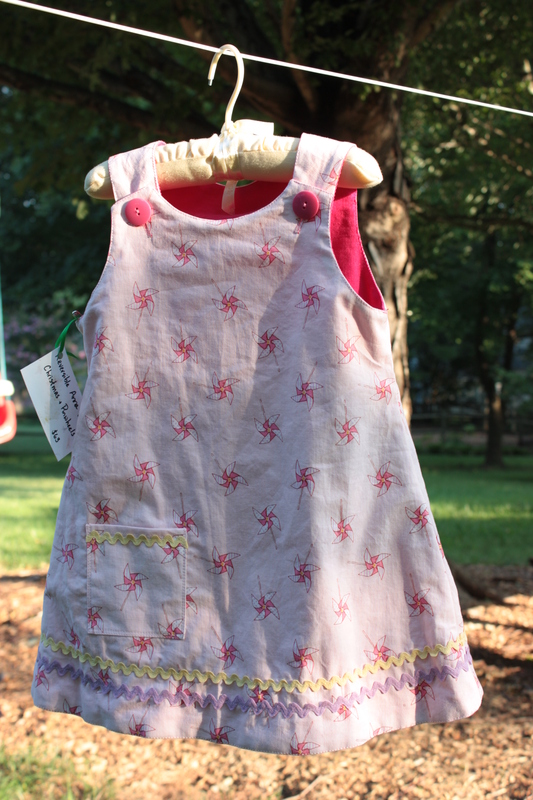 The Anna style and the Camille style dresses can be made in sizes from newborn through size 8. The Marie style is available starting at size 2. Prices for dresses that are custom-made will vary some from these prices and depend on the style, size, and details of the particular dress. Please see my prices page for more information about custom dresses, or contact me below to talk about your ideas. Well, technically she didn’t actually make them- no needle and thread for the 2 year old – but she did design them. 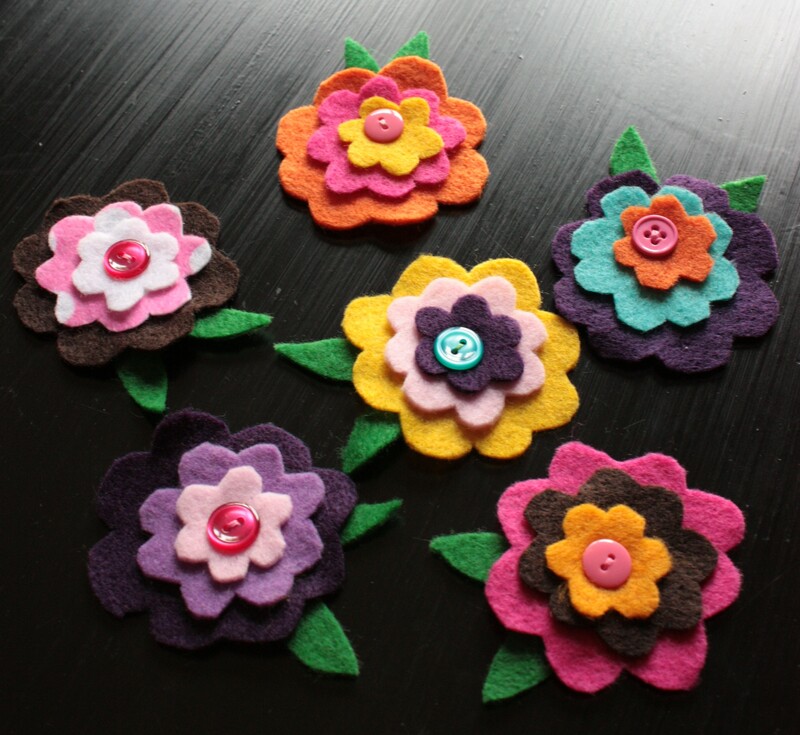 She stacked up all the little flowers and put the leaves on, and then picked out the perfect buttons for their tops. I think she did a great job, especially for a girl who often tells me that blue and orange don’t match! 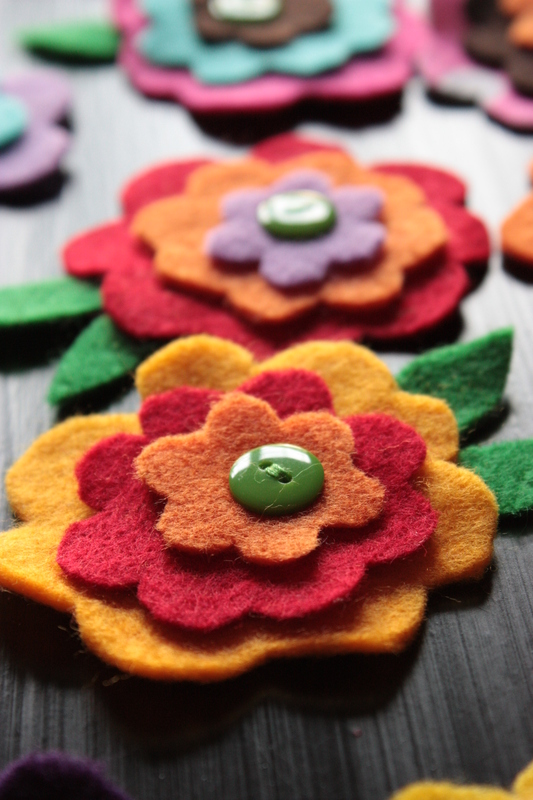 So now we have a garden of felt flowers to enjoy and sell. And more to come, once my cutting catches up with Caroline’s stacking. The question is, what should we do with them (besides admire their happiness and beauty)? 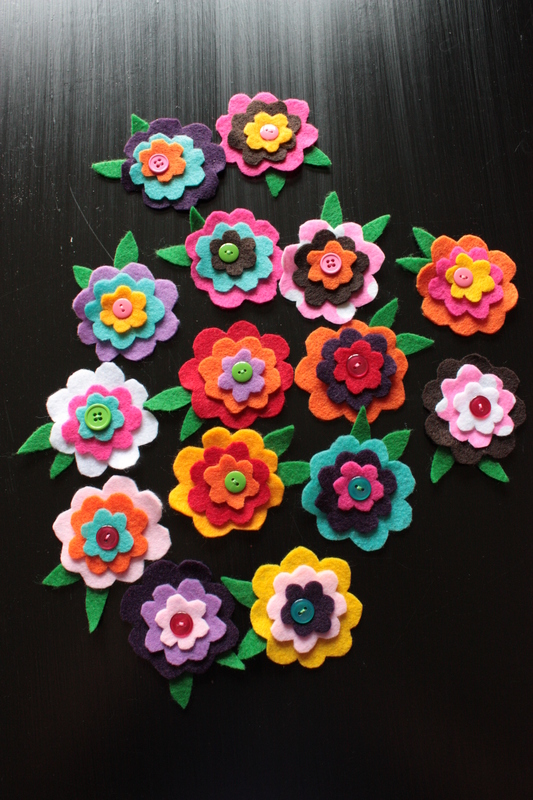 I have some ideas – putting them on a headband being one – but I love to hear what other people would do with fun things like felt flowers. 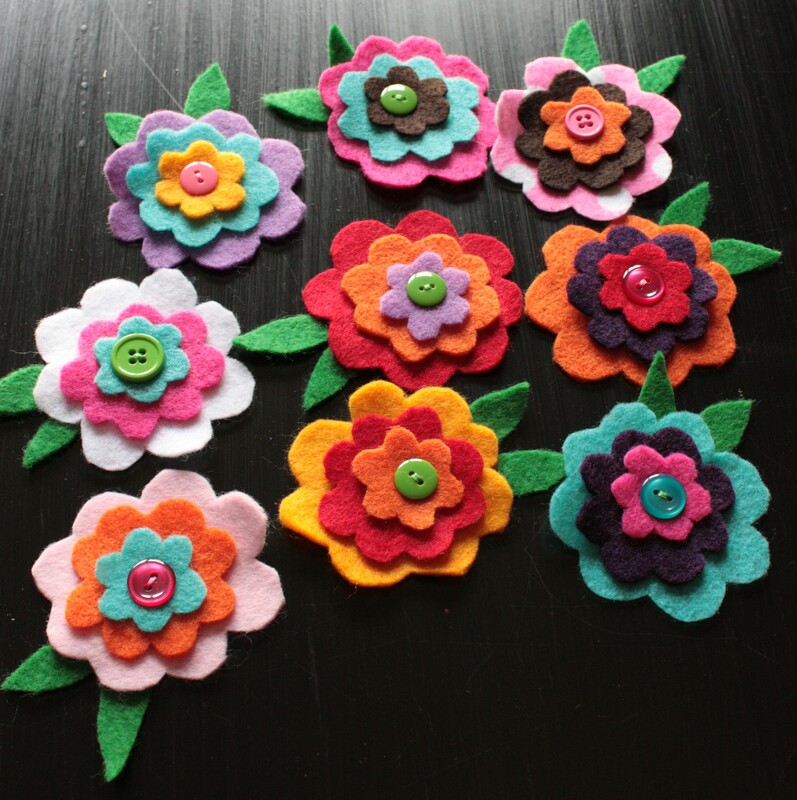 So over the weekend I’m holding a contest: send me your ideas for the felt flowers. What would you do with them, or how would you want to attach them? How would you like to see them available for sale? I’ll read through the responses Tuesday night and pick my favorite, then send the winner a flower. So put your creative caps on and send me some ideas- I can’t wait to see what you come up with! I’ve been working hard for a couple of months on my fall/winter dresses – designing and picking fabrics and styles. Now comes the satisfying part of actually putting them together and seeing how it all looks. I’ve literally been waiting on some of this fabric since the end of June- it’s so new it just hit the stores in July, and then some immediately sold out. But I think I finally have all the fabric in, so now I just have some dress construction to do! Whew! It’s been a busy sewing week around here. I’ve had lots of different projects going, and been working hard trying to get them out on time. It’s been a fun week though. I really do love what I do, and though the busy weeks can be stressful and tiring I feel such a great sense of accomplishment when I get everything done. And I absolutely love delivering things that people are happy about; it brings me joy to make beautiful things for other people- especially when they really like what I’ve done for them. My mom ordered this set from me a few weeks ago for a baby shower she’s attending this weekend. She requested green, yellow, and turquoise, and I couldn’t find anything in my fabric stash that I really liked in that combination. So I went searching online for fabric and came across this one that’s perfect! Once the fabric came in I had to move quickly to put this together and get it in the mail in time to reach her for the shower. Done! Another friend brought me fabric to make throw pillows last week. With our trip to the beach last weekend I wasn’t able to start on them until this week, and she needed them for a shower she’s hosting this weekend. So they were my midweek project this week. I always enjoy sewing for this particular friend because I love her taste in fabric. 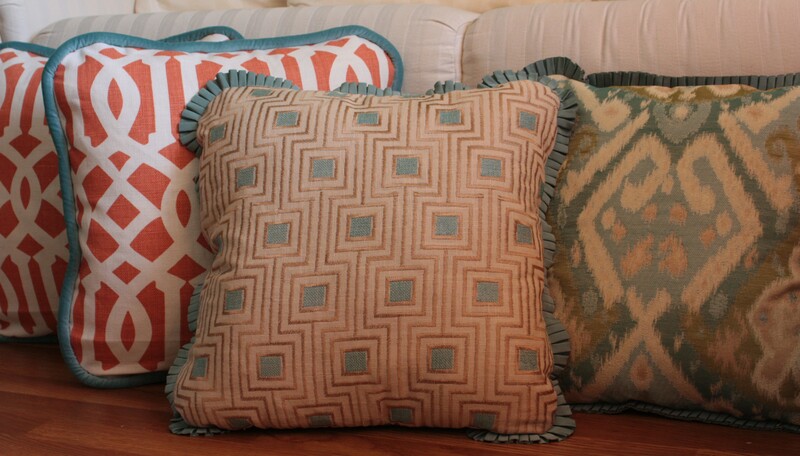 This time was no different – I enjoyed working with her fabrics and I love how the pillows turned out. She was happy about them too. Yay! 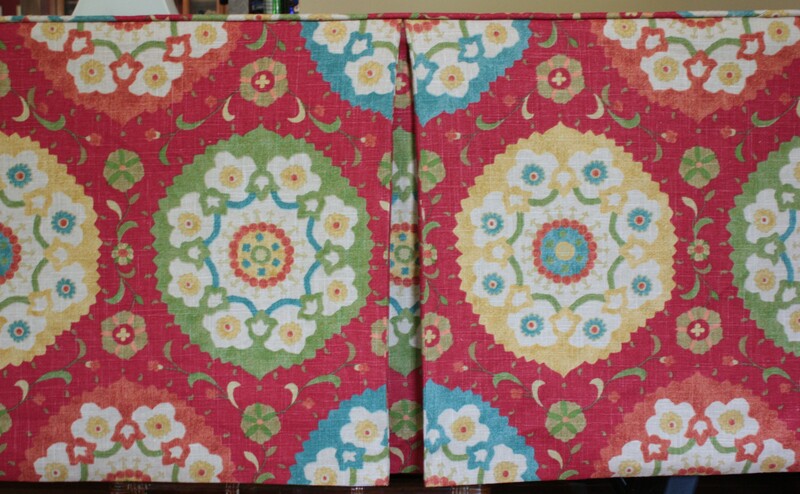 I’ve been working with a designer to make this valance for a friend and former neighbor for awhile. Once the fabric was chosen and delivered to me I was eager to get to work on it. It is definitely the longest valance I’ve ever made, coming in at over 9 feet, and getting the medallions to line up all the way across took some solid thinking. Then there was the challenge of getting it stapled to the board in my not-so-big house, which is the part I finished up this morning. But I’m very pleased with the end result and hope it looks fabulous in her kitchen. At the very least it will add a lot of color! 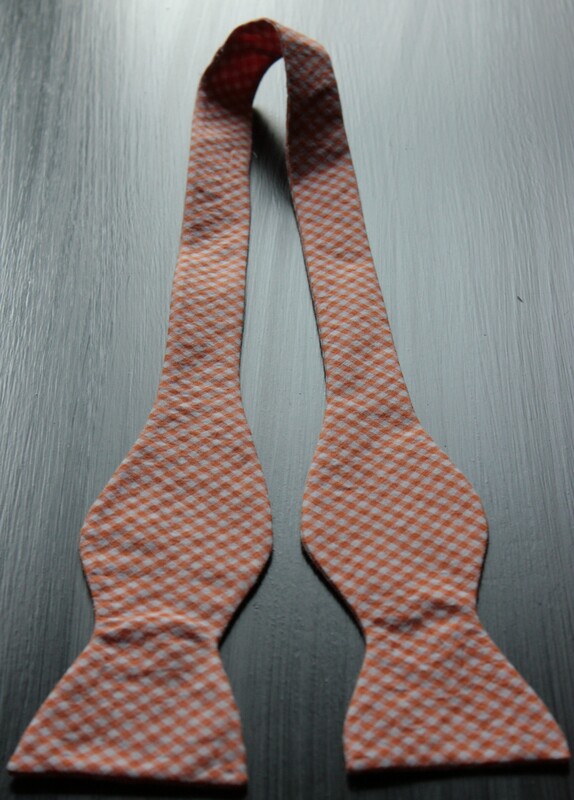 Finally, I finished this bowtie. 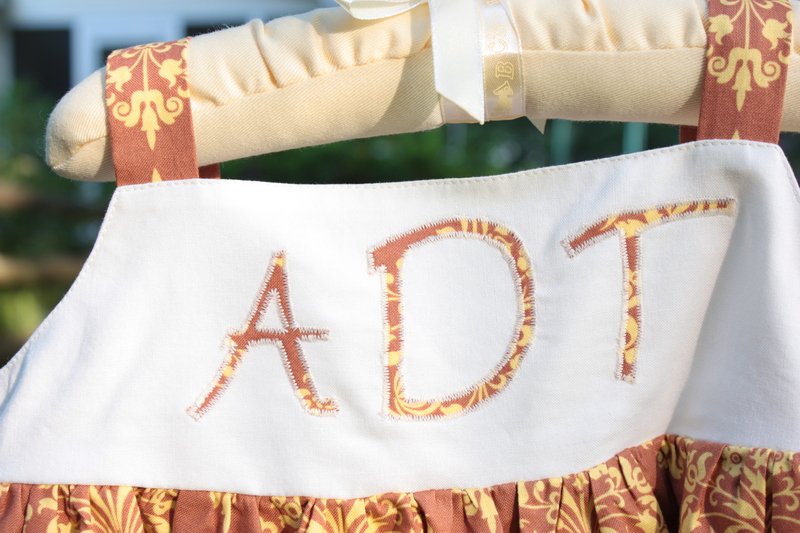 It’s been in the works for 6 weeks, but I’ve had so much going on – sewing and otherwise – that it keeps getting shelved. But I’m determined to take it to my friend on Sunday. Plus my daughter informed me this morning that I needed to finish it. So it was today’s other project, and it’s all done. Ready for delivery on Sunday. In the midst of all the actual sewing I’ve been doing a lot of legwork on my fall and winter dresses, in anticipation of a trunk show less than a month away. 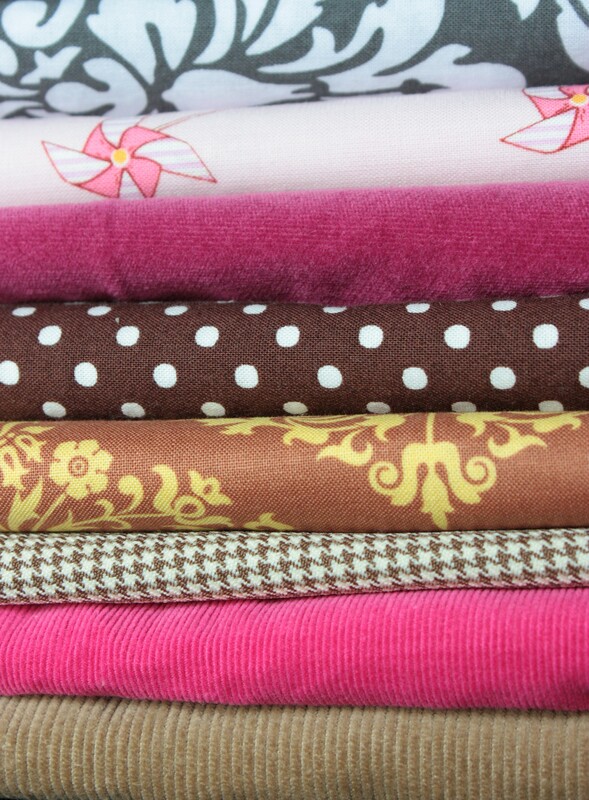 I still don’t have all the fabrics I need, but (finally) most of them are currently in route to me. One more dress is still in the design stage, but I saw some brand new fabric online yesterday that inspired me. I think it’s time to get down to the actual business of putting these dresses together, so keep an eye on my blog for pictures as I get things going! I’m excited to see it all come together, and I hope other moms will be too.